Entering its 4th year, the CIAA developed an inclusive and progressive platform for great minds to convene and to network to build social capital,grow through education, and collaborate to address the issues and concerns faced by MWBEs and professional communities. 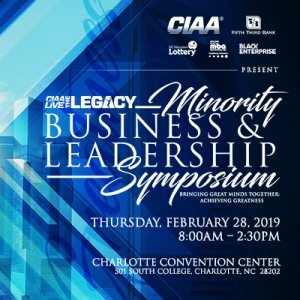 This initiative also allows MWBEs to learn more about the CIAA beyond the games, understand its business model, economic impact, and engage with one another as members of this business community. Early Registration for the Symposium & Business Luncheon is $50 until February 17, 2019. Late registration begins February, 18, 2019 and is $75. Don’t delay, capacity is 200!